Charles Howell III uses an overlapping grip. You probably could fill a decent-size library with all the instruction books, articles and videos that offer advice on every golf shot, strategy and piece of equipment on the market. But none of that advice means anything if you don’t grip the golf club properly. The grip is the foundation for everything you do on the golf course. If you decide to take lessons from a PGA pro, most likely the first thing he’ll do is check your grip. If you’re a beginner or just trying to improve your game, look at your grip first. With the clubhead grounded and pointing away from you, grasp the top of the grip with your left hand, if you are right-handed. Place the grip’s edge on your heel pad, which is the fleshy section at the base of your hand below the pinkie. Make sure the grip runs diagonally across your hand to the middle section of your index finger. Place your left thumb down on the shaft and pointed very slightly to your right. The “V” shape between your thumb and the rest of your hand should point toward your right shoulder or collarbone. Place your right hand on the club, below your left. Interlock your right pinkie between the index and middle fingers of your left hand. Alternately, lay your right pinkie on top of the left forefinger or in the gap between the fore and middle fingers. Place the lifelines of your right hand – the two large lines running horizontally on your hand – over your left thumb. 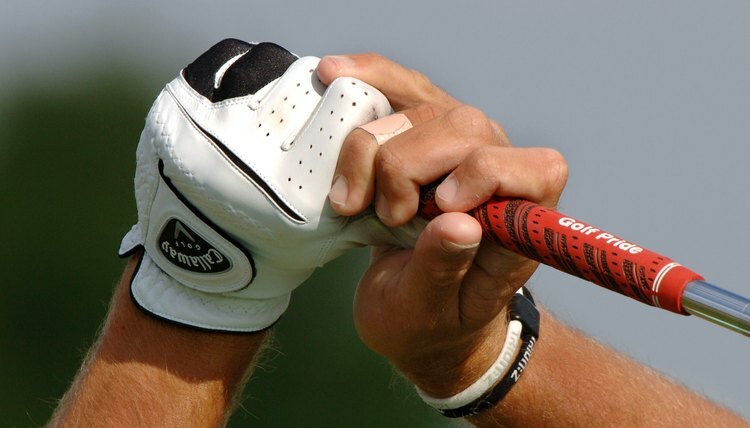 Make sure the club's grip runs across the middle segment of your right index finger. Drop your right thumb onto the shaft, pointed very slightly left of center. The “V” formed between your right thumb and hand should point directly to your right shoulder.